Pre-orders of the New Xiaomi Mi Box S Now Available! 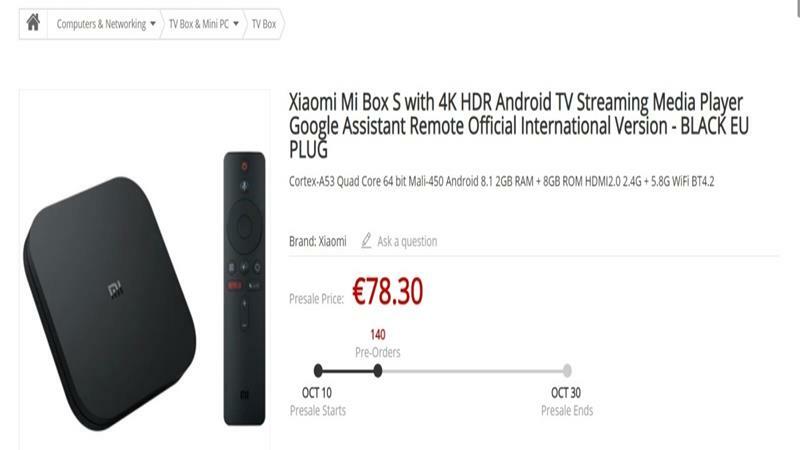 Our magazine is pleased to inform you that Gearbest has just begun the pre-orders of the brand new Xiaomi Mi Box S, which had been delayed as we informed you in this article. Pre-orders began on October 10 and will end on the 30th of the same month. At the moment, the lowest price we’ve found is at 78,30 €, plus shipping, and you will find it here. You’ll have a Cortex-A53 Quad Core 64-bit processor Mali-450 “running” Android 8.1, 2GB RAM, 8GB ROM, output HDMI2.0, WiFi 2.4G and 5.8G Bluetooth 4.2. Our magazine has already pre-ordered it and will present it to you at the first opportunity.